The Kandos street machine and hot rod show is one of the town’s main annual cultural events. chapel of rubber is a mixed media installation that acts as a shrine to rubber, burnouts, metal, wheels, donuts, horsepower, petrol, fire and smoke. chapel of rubber was selected as a finalist for the Blake Prize 2013. The exhibition opened at the new COFA gallery on October 17th. 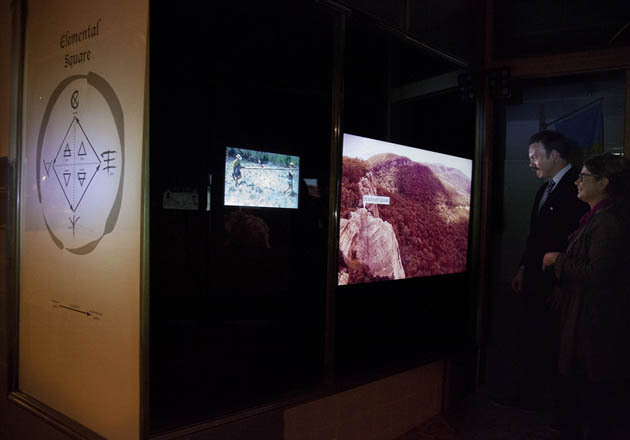 Cementa_15 happened in kandos, NSW April 9-12th April 2015.
elemental square is a 2 channel video work installed in Kandos Projects shopfront window. A land art sculpture representing the four elements was constructed from natural material at Swampy, a local site. Using a drone launched from Stockyard Point the camera sweeps down the escarpment to capture the immolation of the sculpture.